Gordon Matthew Thomas Sumner (born October 2, 1951), better known as Sting, is an English singer and musician. He first became famous as a member of the band, The Police. 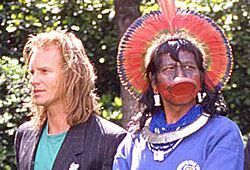 Sting was born in Newcastle, England in 1951 where he attended St. Cuthbert’s Catholic High School. His father was a milkman in an area dominated by the shipbuilding industry. From an early age, Sting displayed an aptitude and love for music, in particular, the bass guitar. He sought to pursue a career in music, and took part in a variety of local gigs and gained some employment on cruises. He received his name Sting from a black and gold striped rugby sweater he used to often wear when performing in a Dixieland jazz band, in which people said he looked like a bee. His big breakthrough came with the rock band Police. In 1978, he moved to London where, with Stewart Copeland and Andy Summers, they formed a group ‘The Police’. They went onto sell many best-selling albums and won six Grammy awards. The song ‘Every Breath You Take’ from their last album ‘Synchronicity’ is one of the most played songs on the radio of all time. In 1985, he released his first solo ‘The Dream of the Blue Turtles’. This led on to a very successful solo career. The group Police have only sporadically re-united to play charity gigs and the odd tour (2007). 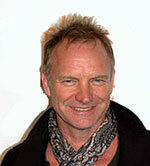 Sting has experimented with a variety of music from classical to rock and jazz. To Sting music doesn’t have to fit into neat boundaries. He also talks of how music is important for expressing his feelings. He recorded albums dedicated to both his parents after they passed away. The 1991 album The Soul Cages (to father), and Nothing Like the Sun in 1987 (to his mother). His first wife was Frances Tomelty. They were married on 1 May 1976; together they had two children, before divorcing in 1984. He married Trudie Styler in 1992, with Trudie, he has had another four children. He was awarded the CBE (Commander of the Order of the British Empire) in the 2003 Queen’s Birthday Honours List for his services to Music. Sting makes an average of $2,000 per day in royalties for the 30-year-old song “Every Breath You Take.” The song is officially the most requested radio song of all time.